The Union have largely been their own worst enemy through the first month of the season. The team has been able to control the possession game for the most part, and CJ Sapong is one of the most clinical finishers in the league so far (10 shots, 6 on goal, 3 goals). The problem for Philly seems to be losing possession in their own half, particularly when their attack is just getting started. NYCFC have a relentless attack and have controlled possession even against teams that had that as their game plan coming in, so Jim Curtin is going to have to figure out a new game plan to deal with the suffocating City front of Rodney Wallace, Jack Harrison, and David Villa. The Union also like to build and attack through the middle – a strategy that may have been effective against City in the past – but with their new and improved midfield ready to “defend from the front,” it could end up being a long night for the home team. Punishing Philly’s inevitable mistakes along with disrupting their midfield will be the name of the game for City. The Union are better than their record suggests – but not much better. Philly is winless through their first five matches, but they have been very unlucky in the closing minutes of their last three matches. Their attack is a potent one if you fall asleep on it, particularly on set pieces where Keegan Rosenberry and Richie Marquez can be effective in the box. Maxime Chanot and Alexander Callens will have their work cut out for them in the closing minutes if City is ahead. It will be important that the Boys in Blue don’t mentally check out – something Patrick Vieira has been critical of in the past – as their opponents are desperate for a win, and will be playing in front of their home fans. Alexander Ring: The Finnish midfielder will be charged with limiting the play-making ability of US International Alejandro Bedoya, as well as Chris Pontius and Ilsinho. If he can be the player we’ve seen him to be thus far, he’ll get into Bedoya’s head and force some mistakes of which City can take advantage. 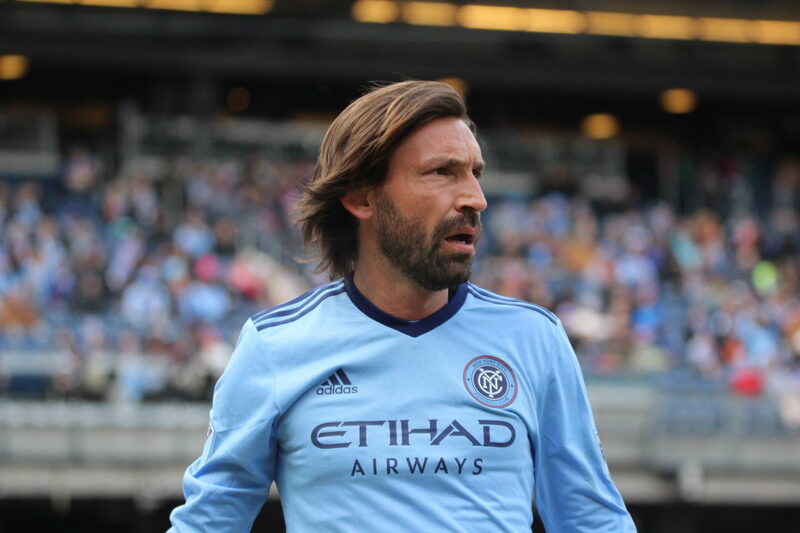 Andrea Pirlo: Under some scrutiny in recent weeks as Tommy McNamara has been making statement after statement in his role as an impact sub, Il Maestro will have a chance to put his skills on display against a Union defense that is weak on both through balls and long balls – the precise combination Pirlo has enjoyed employing for his entire career. Will the Italian legend give pause to his critics? The Back Line: Last week we saw Vieira shake things up by using three center-backs – an experiment not even the man himself would say was successful. It will be interesting to see if Vieira goes back to the 4-3-3 that had done so well, or if he is so concerned with Philadelphia’s set-piece play that he feels the need to once again include Frederic Brillant. Should that be the case, it will be a make-or-break effort for the Frenchman. Given the nature of the Union’s overlapping runs, however, three at the back would make little sense in the grand scheme. Projected Line-ups: NYCFC has only Mikey Lopez still listed as “Questionable” as Jon Lewis has been cleared from a week-long stint on the Injury Report. Philadelphia will be without Josh Yaro, Maurice Edu and John McCarthy. If NYCFC from the START presses Phily we can win 3-1. Pirlo will do his ALWAYS best.